Richard "Hamster" Hammond, Jeremy "Jezza" Clarkson, and James "Captain Slow" May. They like cars. This... is a car programme. There will be no cushions, there will be no rag-rolling, no-one will sing, and at the end of the series, no-one will have a recording contract. This is our new base, and this is our purpose-built test track. There are no traffic jams here, ooh... apart from this one, and no bus-lanes either. This... is Top Gear! Top Gear: Ambitious but Rubbish! Top Gear was an award winning (BAFTA/Emmy) BBC magazine series about automobiles and motoring. It started in 1977 as a fairly conventional auto show, but after being revamped in 2002 (following a one-year cancellation in 2001-2) it took a turn to become more overtly humorous. The show was very popular, with an audience estimated at about 8 million per week on the BBC and around 350 million worldwide. Jeremy Clarkson: The leader of the central trio: the oldest (59), tallest, and most obstreperous. Tends to be very vocal in his dislikes and self-confident to the point of arrogance. Also physically the most fragile. Given his choice of cars (and most everything else, really) he prefers sheer raw power (preferably with the noise to go with), then control, and then speed. Clarkson, who had become a celebrity in Britain for co-presenting the original format of Top Gear from 1988 to 1999, was the one responsible for successfully pitching the 2002 revival of the show to the BBC. He is also the most likely to get into hot water for his on-air remarks -- as for instance the furor after his joking suggestion that participants in the recent UK public sector workers' strike should (among other things) be shot in front of their families. Richard Hammond: The second in command: the youngest (49), shortest, and second-most obstreperous -- also Mr. Fanservice. Described by the others as the toughest physically but the most fragile emotionally. Tends to be chatty and moody. Given his choice, he wants a fast, powerful car, but the love of his life is a 1963 Opel Kadett with under 50 hp, named Oliver. Known affectionately as "Hamster" for his size, chattiness, paper eating, and willingness to engage in risky stunts. Hammond is so willing to engage in risky stunts that in September 2006, he suffered a near-fatal brain injury after crashing at 288.3mph/464.0km/h during a test of a jet-powered car. (He later got better.) Has been noted for his similarity in appearance to both Matt Bellamy and David Tennant. He's also the host of the series Blast Lab, Total Wipeout and, formerly, Brainiac: Science Abuse. A new series, Richard Hammond's Crash Course, just started a run on BBC America in April 2012. James May: The Quiet One (relatively speaking) somewhere between Clarkson and Hammond in age (56) and height: a picture-perfect Straight Man with an understated sense of humor and a gift for deadpan delivery. Likes physics, classical music, alcohol, light aircraft and interesting facts. Far more careful than the other two, and obsessive (to the point of possibly suffering from OCD) about details, down to the proper arrangement of his tools. May is implicitly acknowledged to be the most technically savvy of the three. He prefers control and good handling over power and speed, and absolutely refuses to run on camera. The other two have dubbed him "Captain Slow" for his (self-explanatory) driving style. Like Clarkson, May was a co-host of the original Top Gear format, although his tenure on that programme was only for a brief time in 1999. Aside from hosting Top Gear, May has also hosted quirky, fact-based single-series documentary programmes such as James May's Toy Stories, Oz and James and James Mays Man Lab. The Stig: The show's "tame racing driver," who is never seen without his racing coveralls, gloves, and (face-concealing) helmet. He is also never heard speaking, though we hear about occasionally the driving advice he gives off camera. Some say he naturally faces magnetic north, and that all of his legs are hydraulic... all we know is, he's called The Stig. There have been three Stigs since the show's inception. The first Stig, Black Suit Stig (Perry McCarthy, 2002-2003) was written out of the show after the BBC did not renew McCarthy's contract. The first White Suit Stig (Ben Collins, 2003-2010) was sacked for publicly revealing his identity . 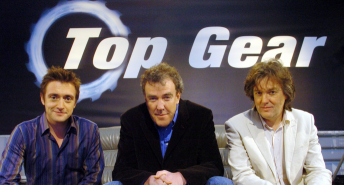 The show's appeal, which extends far beyond driving enthusiasts or even car-owners, was the interplay of the three presenters and what May referred to in an interview as "self-indulgent cocking-about." In addition to doing more conventional car test drives and reviews, it had undertaken a number of segments which feature unique premises. The show ended in 2015 when Clarkson punched a production assistant in a racially heated argument over an inability to get food, with Hammond and May departing soon afterwards. The BBC announced it would replace the series with a similarly titled and themed show starring Chris Evans named Top Gear. Meanwhile the trio have signed on to produce a similarly themed show (but with a far bigger budget) for Amazon titled The Grand Tour. For more detailed examples of what cocking-about one might actually see, please check the Segments page. The Australian version, obviously named Top Gear Australia had Warren Brown (replaced by Shane Jacobson for after second season), Charlie Cox (replaced by James Morrison for the second season, and then Ewen Page for the third and fourth) and Steve Pizzati bringing their own brand of entertainment to the normal Top Gear format... The first episode alone had Warren using a small car as Great White Shark bait. And let's not get started on the other crazy things they've done. The Pizzati/Page/Jacobson team appeared in an episode of the original British show, but Top Gear Australia was canceled in September 2011. There is also an American version which now has its own page. The show also has an official, legal and above-board YouTube channel with abridged versions of various segments. This page was last edited on 3 May 2018, at 20:42.